’19 Ford FC – Breaks Cover! 2019 Ford Mustang NHRA Funny Car Seeks To Become Fastest Mustang Ever! At the SEMA Show in 2017, Ford announced it would return to NHRA Funny Car racing in 2018 and prepare a new Mustang body for competition for the 2019 season. 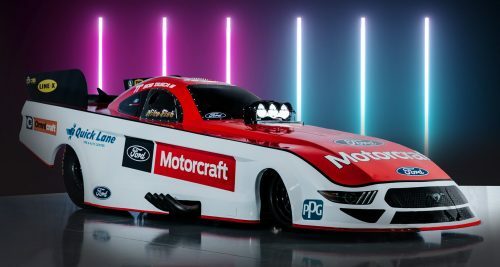 Fourteen months later, that new Mustang body is ready to make its debut in the hands of Bob Tasca III’s Motorcraft/Quick Lane NHRA Funny Car team as NHRA hosts its official pre-season test this week in Phoenix. The 2019 Funny Car body is not only the first new body for a Nitro-powered car for Ford in a decade, but also the first Ford racecar to skip the full-size prototype phase of development. It’s the result of a process that has significant cost reduction implications for both road and race vehicle design. “When our new Mustang Funny Car hits the track in 2019, we fully expect it to validate the motorsport development tools we’ve worked hard to create and refine,” said Mark Rushbrook, global director, Ford Performance Motorsports. “When you’re discussing the realm of speeds exceeding 300 miles per hour, tolerances in aerodynamics become minuscule. Even the slightest change can have a massive effect. Working in such a focused space allows us to gain insight to aerodynamic improvements for both our racing and road cars. Tasca’s Motorcraft/Quick Lane Racing team, guided by returning crew chief Eric Lane and newly-named co-crew chief Mike Green, will put the car through its first NHRA-sanctioned test session before the approaching NHRA Winternationals in Pomona. Tim Wilkerson, who has operated a successful single-car privateer operation for many years, will also be running the new Mustang body for the 2019 season, and echoes the excitement of longtime friend and rival Tasca. The 2019 NHRA season begins with the Lucas Oil Winternationals in Pomona, Calif. on February 7-10.